January 8 2019, 18 days into the longest government shutdown in American history. Although city and state budgets have not been affected by the shutdown, most federal programs have stopped due to the shutdown. Es­sential services are the only federal government programs open at this point. Rural Water Association of Utah’s Northern Circuit Rider Jake Wood was called into action by Jeff Schnars, General Manager for South Duchesne culinary water system. Jeff called for some assistance re­garding two separate water leaks in their system. The leaks were locat­ed near the booster station at the bottom of the system. This posed a unique problem as South Duch­esne’s water system purchases water from a nearby system. Only one source feeds the roughly 168 customers on the system. Because the booster station is at the bottom of the system and needs to over­come 310 psi in order to get water flowing uphill, it takes much longer to fill the distribu­tion system and tanks. Jeff turned the supply line off the day before to help alleviate some of the pres­sure so repairs could be made. A local contrac­tor was also called in to provide equipment to excavate the leak. 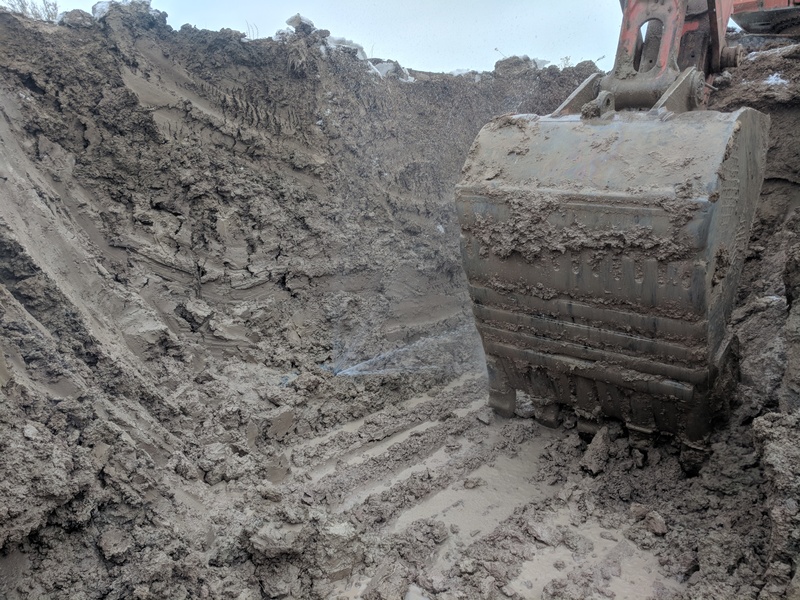 A large excavator was needed for this repair due to the water main being buried 10 feet underground. The following morning Jeff and Jake met at the area of the leak to discuss a plan to repair the main. Throughout the process of exca­vation, several customers called the Division of Drinking Water to report loss of service. Those calls were followed up by the Division of Drinking Water’s Emergency Re­sponse coordinator Ryan Dearing. Ryan and Jake had spoken prior to excavation and maintained contact throughout the repair process. After the repairs were made the booster pumps were turned on to start filling the systems main lines. During this time Jake advised Jeff to begin flushing hydrants throughout the system. This would not only help flush the lines but remove trapped air from the system. The two discussed a sampling plan to confirm the presence or absence of any bacteria that may have en­tered the system during the time the system had lost pressure. Part of that plan consisted of taking a minimum of 5 bacteriological samples throughout the distribu­tion system and following up with a minimum of 5 more the following day. A boil advisory was also issued to all customers to ensure their safety until the first round of bac­teriological sample results became available. Although the systems main source was off for two days, it likely felt much longer for the employees of South Duchesne. This created a big task; contacting all the customers to inform them of the interruption of service. South Duchesne employees went above and beyond by putting out bottled water to those who re­quested it, lining up equipment to repair the line, and tracking the chlorine residual for each tanker load of potable water delivered to the system during the line shut­down. When a community water system calls for help, the Rural Water Association of Utah is ready and willing to send staff to assist regardless of the difficulty of the task ahead. Their qualified staff are just a phone call away to advise or assist under any circumstance.